When you’ve had water soaking your wood floor for any extended period of time damage is happening, although you may not see it right away with your own eyes. The most important task to undertake is to dry out the floor surface as soon as possible—and especially the sub-floor. If you have a sub-floor constructed of plywood, the drying of the underside of the affected hardwood floorboards will be very difficult. This is because of the waterproof nature of plywood. Drying a wood floor quickly is important not only to stop the warping of the surface, but also to keep mold from forming on the wood. 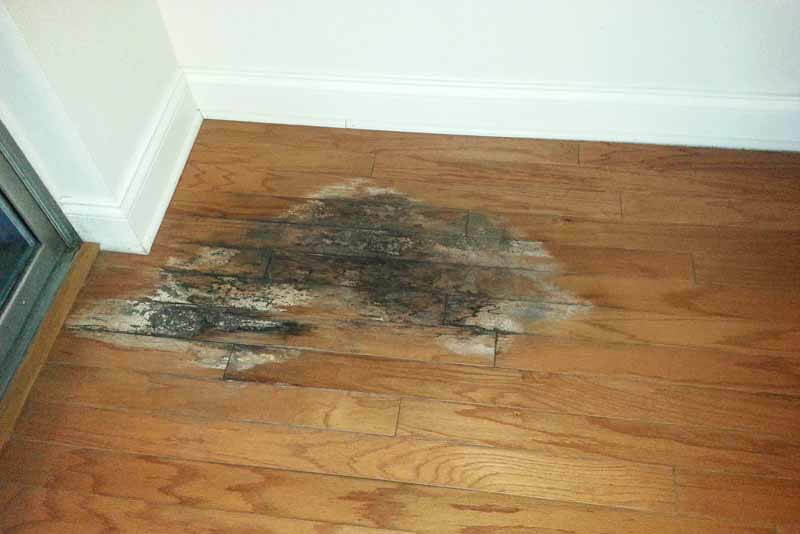 In fact, mold spores often remain on the wood even after the floor has dried. Mold can adversely affect the health of everyone in your household, particularly those with conditions like asthma and other respiratory problems. To accomplish the drying process you should start with large fans which you can buy or simply rent. You should aim them directly at the affected flooring, of course. If you have air conditioning you should turn it on—be sure to leave all windows open near the affected areas. The windows should be open at least 2 inches. This will allow the excess moisture to be pushed outside. If you have a crawlspace or basement you should also place industrial fans there, pointing directly in the direction of where the water has leaked through. If there is a finished ceiling below the floor, it might be a good idea to cut a neat square in the drywall. This will help the fans to better dry the underside of the sub-floor. The cut square should be easily repaired later. In fact, you may also want to drill a few holes into the sub-floor itself where the leak started; this will ensure that there is no puddle of water standing between the floors. If possible, you should ventilate the basement—unless the weather is particularly humid. If this is the case, use a dehumidifier in the basement to dry up the excess moisture. Unfortunately, the wood itself will continue to swell. However, if it gets to a point where you cannot walk across the surface, you can relieve some stress by removing two boards at least halfway to the kitchen area. The bonus is that you’ll also allow more ventilation of the sub-floor. It’s best to bring in a wood floor contractor who will be equipped with an electronic moisture meter. This device will be used to test good wood unaffected by moisture to determine its EMC (equilibrium moisture content), using the findings as a “control” to compare with the flooded wood’s EMC. It’s a good idea to document these figures with the dates you tested the wood. The hardwood floor and the sub-floor must reach normal EMC before the floor itself can be re-sanded. Some insurance companies may prefer having all the damaged flooring removed and replaced quickly. You wouldn’t want to argue with them about this one if the insurance company is offering to cover the entire cost of replacement/materials. If this is the case it’s likely that the insurance company foresees possible mold damage, or they might want to determine what damage remains permanent. Since any expenses that you incur from drying the wood may be covered by your insurance company, you’ll want to keep any receipts from purchasing or renting fans and/or dehumidifiers. So, going with the scenario noted above, let’s say that the insurance company instructs you to have all of the damaged flooring removed and replaced—you’ll still have to deal with the sub-floor. In fact, you’ll need to monitor the sub-floor until the EMC is back to normal. This will require time plus plenty of ventilation. You might be monitoring the EMC for a month or more. Here’s another scenario. Let’s say that you’ve discovered only minimal damage because the water drained well and the flooring dried quickly, you should wait approximately 4 – 6 months before sanding the hardwood floor to its previously flat appearance. Sanding the floor before it’s had a chance to completely dry will cause the cupping (concave surface) to straighten out after the sanding, creating a crowned (convex) surface. Unfortunately, this will mean that you’ll have to sand the entire floor again. Word to the wise: Do not allow your insurance company and/or a contractor to rush you into having the wood flooring sanded too soon. Doing so can remove as much as a third of the total life of the floor if it has to be re-sanded over and over again. A hardwood floor has only so much of a wear layer on top of the groove. If the damage has spread into another room, and has to be completely sanded and finished, it would be prudent to ask your insurance company to cover the work. 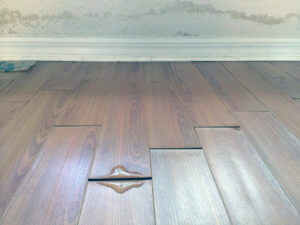 Remember: when you’ve had excess water and moisture invade your flooring you must act quickly: 1) Dry the floor and sub-floor immediately; 2) Check and recheck EMC of both the wood floor and sub-floor; 3) Remove a few boards to relieve stress; 4) Begin repairs once you are certain the top floor and sub-floor are completely dry (remember those EMC levels!). Watch for signs of possible mold growth. Keep accurate records and document everything you’ve done, presenting it to your insurance company. Taking these methodical steps will go a long way towards restoring your flooring quickly and in a cost-effective manner.